Housed in the Palais de la Cité, the seat of royalty from the 10th to the 14th centuries, the Sainte-Chapelle is one of Europe's finest examples of high gothic architecture, offering a luminous, ethereal beauty that many visitors to Paris unfortunately never experience. Built between 1242 and 1248 under order of King Louis IX, the Sainte-Chapelle was constructed as a royal chapel to house the Holy Relics of the Passion of the Christ. These include the Crown of Thorns and fragment of the Holy Cross, which had previously belonged to the rulers of Constantinople when it was the center of Christian power. In purchasing the relics, which far oustripped the overall cost of building the lavish chapel itself, Louis IX's ambition was to make Paris a "new Jerusalem". Situated on the Ile de la Cité, the central strip of land between two banks of the Seine which defined the borders of early medieval Paris, the Palais de la Cité and the Sainte-Chapelle were badly damaged during the French Revolution in the late 18th century. 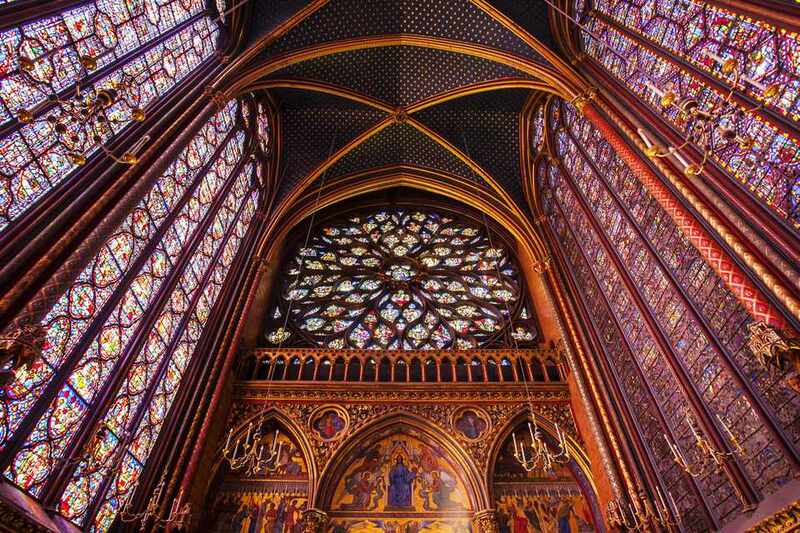 Much of the Sainte-Chapelle was reconstructed, but a majority of the delicate stained glass is original. The sumptuous upper chapel counts a head-spinning 1,113 biblical scenes carefully etched into 15 stained glass windows. Closing Days and Times: The chapel is closed between 1:00 and 2:00 pm during the week, and on January 1st, May 1st and Christmas Day. Note: Last tickets are sold 30 minutes before the chapel closes. Adults pay full-price admission to Sainte-Chapelle, while children under 18 enter for free when accompanied by an adult. Disabled visitors and their escorts also enter for free (with a proper identity card). For up-to-date details on admission fees, consult the official website. Guided tours of the chapel are available for individuals and groups. Call to reserve. Special assistance and adapted tours are available for disabled visitors (enquire ahead when reserving a tour) Joint tours of the Sainte-Chapelle and the adjacent Conciergerie are also possible. The Sainte-Chapelle is fully accessible to disabled visitors, but some may need special assistance. Call to ask about special tours and accompaniment.